AGL is rolling out smart meters in South Australia – but is avoiding the word “smart”. While the roll-out is not ‘compulsory’, it is by default. People will need to ring AGL to cancel the installation of a smart meter prior to the installation between 31 October and 11 November. However, residents are given only one week’s notice to cancel the installation. 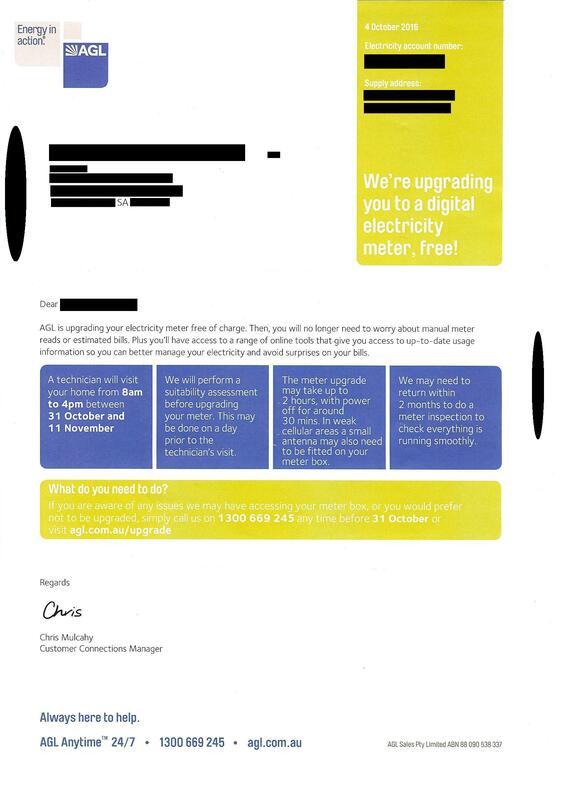 AGL refers to wireless smart meters as ‘digital meters’. This is misleading. Of course all communications-enabled smart meters are digital meters, but NOT ALL digital meters have a radiofrequency communications chip. 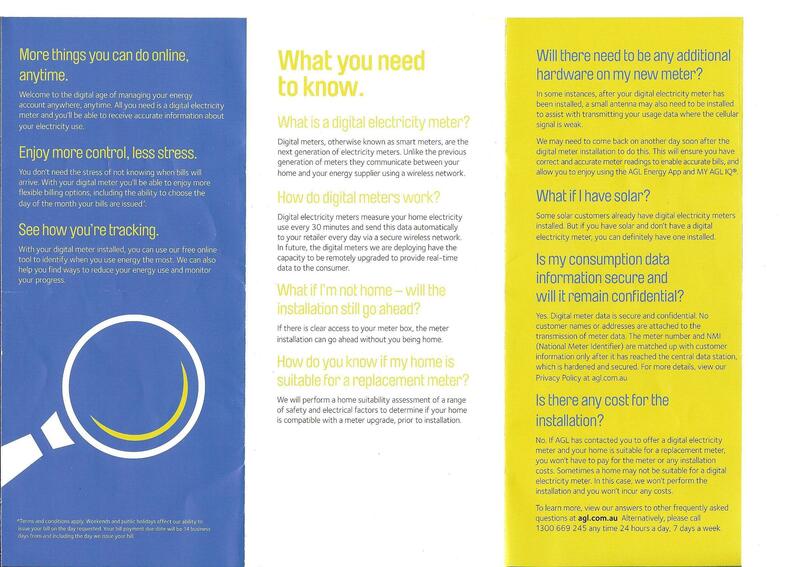 Does AGL fear people will be more inclined to opt-out of having a so-called ‘digital’ meter if they are fully aware of what they are being offered: a wireless device that emits pulsed radiation every day, 24 hours per day? See below for copies of AGL propaganda sent to South Australian residences (which is identical to the NSW versions). This entry was posted in Smart Meter and tagged AGL, Electromagnetic radiation, Smart meters, South Australia. Bookmark the permalink. Just wish I had been given that option !!!!!! Push to have it removed. Just push and don’t let up. Anybody who forces a situation upon another person whereby that person cannot handle living in their own home deserves to be hung without mercy. Agl installed a digital meter at my friends house today without her knowledge. They have been instructed to remove it, hoping there will not be any charges re doinq so. Wondering how can they be allowed to mislead the public by deliberately changing the meters name to digital rather than calling it a smart meter. AGL is not upgrading, this is false information. They are attempting to install a device that is similar to a mobile phone….that is not upgrading! Analogue meters can’t send and receive information. If you upgrade your fries at a fast food outlet they give you a bigger portion of fries, they don’t completely change what you purchased. 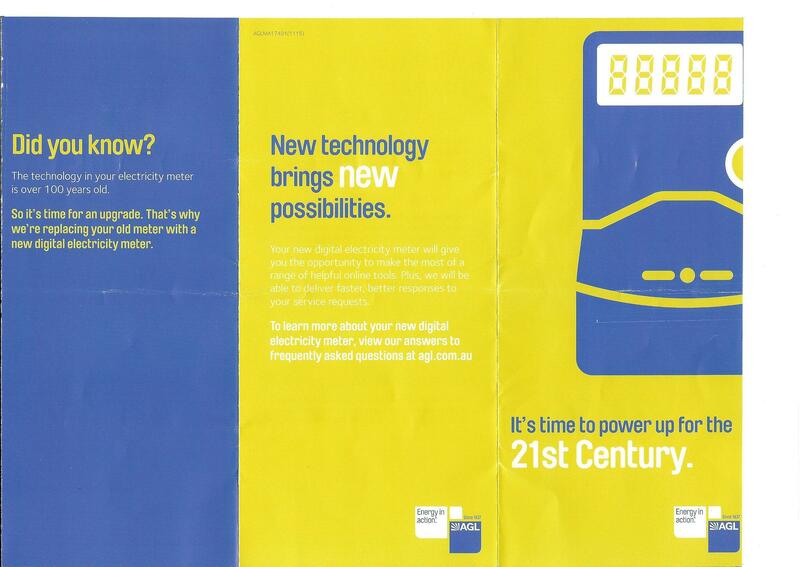 AGL also brought up that the technology in your meter is old. Who said its old? How do they define old? You still have to pay for electricity consumption regardless. The only difference is smart meters have the potential to cause health problems and it’s probably going to be a long time before the real damage is revealed, just like tobacco and asbestos. Victorians have done all the hard work for all of you in other states and you have access to information that people would not have had 20 or 30 years ago to make informed choices. If people are going to allow smart meters to be installed despite all the warnings and all the trauma Victorians have been through, then bad luck. Don’t complain if you get sick and don’t complain about fires because you do have access to plenty of information from the experts. I am pretty sure most people have seen adds warning about mobile phone dangers, so if they choose to ignore these warnings and let them install smart meters, just don’t complain. The CEO of AGL should also be made an offer, disclose all the information and then let people decide or agree to be held responsible and liable in the future for damages. AGL have to disclose if the smart meter is wireless otherwise its misleading and since smart meter’s emit radiation that might cause cancer this makes it even more serious. Looking for someone in Adelaide with stencil knowledge for a 2800 x 500 “stop smart meters.com.au” sign. Please make contact via SSMA website. I have all the steel required, steel posts, concrete, paint, etc. Time is against me, please help! This needs exposing…. is anyone raising this in the media? Radio? 5AA ? Why is AGL getting away with this and placing people at risk for there own self gain!! ALERT!!! this needs exposing to assist the community to understand the risks involved. Who’s getting this exposed to the media and putting out factual information???? Just received a letter from AGL stating that between 17th-24th April 2017 my electricity meter would be removed and a digital electricity meter would be installed. The letter stated that I was to ring a number to let them know if I did not want this meter installed. On ringing I was told that the job had already been allocated and told me to padlock the meter and post a sign on, NO INSTALLATION OF NEW METER. What a farce for AGL to be giving customers a choice and then to be told to do this. They are just deceiving customers. With this sort of response, AGL have certainly got something to answer for. First they’re saying you don’t have to have one of these diabolical digital meter devices if you inform them (AGL) up front but upon informing them they are now saying that you’re still going to get one unless you are very pro active and take the very legitimate action that was taken by some 40 to 60 thousand households in Victoria (the number according to National Metering Database) and lock your meter box with a note stating non consent. HOWEVER this response only further confirms the legitimacy of non consent and the legitimacy of the action to express non consent through the locking of meter boxes as we’ve seen spoke volumes in Victoria. This sort of response from AGL only confirms to those whose meter boxes are locked that they should keep them locked and that they can remain very confident about the legitimacy and the efficacy of this rightful action by anybody who does not consent to the installation of a digital or smart meter, a proven to be very harmful and diabolical piece of apparatus in my opinion.